Home » What are the R&D tax credit rates for the RDEC scheme? The RDEC scheme offers a tax credit of 12%. This enables companies to claim back up to 10p (after the deduction of Corporation Tax) for every £1 spent on qualifying research and development (R&D) activities. This rate remains the same whether you are profit- or loss-making. The R&D expenditure credit (RDEC) scheme is primarily for large companies. These are businesses with 500 or more employees or an annual turnover of over €100m and a balance sheet figure of over €86m. Some SMEs also claim R&D tax credits via RDEC for a portion, or all, of their R&D expenditure. This is because the rules for the SME R&D tax credit scheme include some restrictions for grant-funded projects, for example. 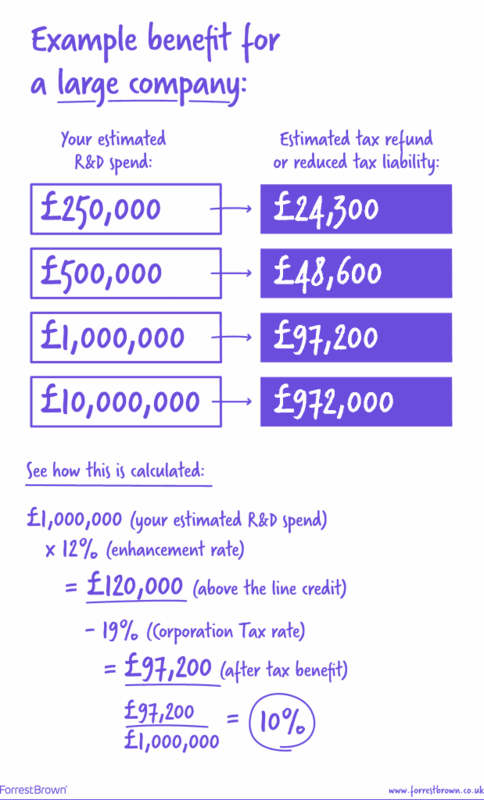 The R&D tax credit rate for RDEC is worth up to 10p for every £1 spent on qualifying expenditure. An RDEC claim is paid out in the form of a taxable credit of 12% of your identified qualifying expenditure. As the credit is taxable, it results in a cash benefit of 10% after tax. There is a fixed offset procedure for the credit. It is calculated as a deduction from your tax bill, or if there is no tax payable, the net amount can be claimed as cash. In its Autumn Budget 2017, the government announced it would increase the RDEC rate from 11% to 12% – effective from 1 January 2018. This increase in generosity is good news for large companies – as well as the SMEs who also use the RDEC R&D tax credit scheme. This change will increase the value of R&D tax credit claims made by large companies – and the growing number of SMEs using RDEC. Our team of chartered tax advisers, technical specialists and former HMRC inspectors advise large, complex businesses on the RDEC R&D tax incentive and deal with HMRC on their behalf. We also help grant-funded SMEs claim R&D tax credits using RDEC. As well as managing the claim process for large companies, we also provide a consultancy service. Typically, this is used by larger businesses that are already claiming R&D tax credits and ask us to focus our expertise on a specific aspect of their claim process – for example, record-keeping.